This is a "preview" of the "Monster Keep" (MK) online calculator! This is just a preview because the screen is just a mock-up. I've basically added all the HTML elements but have not implemented the actions of the various buttons and fields. Type in values in "Card #1" and "Card #2". All "Loading" is done Asynchronously via AJAX. Modify the various stats according to play area bonuses and penalties. Make any adjustments to Tribute points (bonuses or penalties). Click on "Calculate" and the points will be calculated without any hiccups! 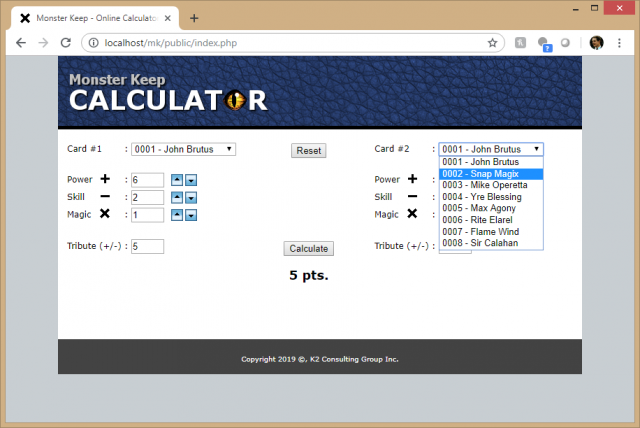 In the event you have modified values, you can "Reset" them to the default card values (and the calculator will re-calculate the points too).